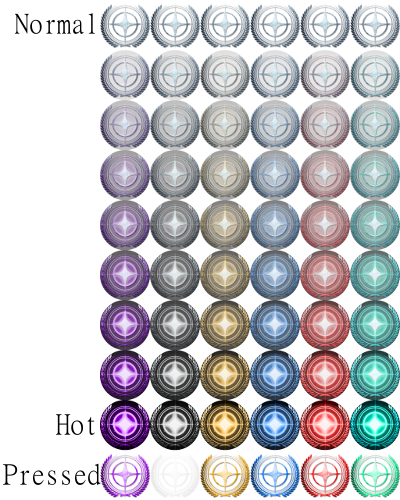 A combination of my longing to create a customized button and my excitement for the forthcoming game Star Citizen inspired me to make these 12 buttons. I took the frames of the logo from a video, edited them and used the morph function of the GAP plugin for GIMP to create additional transitional frames. First, the static buttons. These are simpler than the other 6 in that they only light up. They do have a unique pressed state, as the spinning ones below use the hot frame for pressed. This gif is an example of sorts of the spinning effect of the final 6 buttons. Since it's a gif, it looks really rough and to save time, I only rendered the spin effect twice. The actual buttons look much better. They spin 7 times before settling on the hot state. If I had my way, it would loop forever, but since that's not possible, I used as many frames as I could without the speed going faster than 24 frames per second. These examples are all 50x50 pixels and I think that's the size of the original and Shell buttons. For flexibility and detail, I made them at 256x256. I think it looks pretty nice on my three row taskbar with the size set to 85, but play with it to get it to your liking. I worked hard on these, so I hope you find them to your liking. Very well done! Love it! Now using the animated gold one. Yeah the gold one is so awesome. The logo appears huge when I select it for use as my start button. Anyone else experiencing this? You can change the size of the button from the Start Button tab in the settings. By default it is "0", which means to use the actual size of the PNG file. Often times the button creators make a large image to preserve the quality at various sizes. In that case it is up to you to specify the size that works best for your taskbar. Try something like 40 or 50.